I have just received the answer to a question I tabled about what was the earliest date the two Houses could decant the Palace of Westminster if both Houses voted for that option and what was the estimated cost to the public purse of for repair and maintenance of the Palace in the period between now and decanting. You can read the full answer here. The essential points from the answer are that the earliest we could move out will be 2025 and that over the next five years the cost of repairs and maintaining the Palace will exceed £400m. It seems fair to assume that with the cost for the period between 2021/2 and decanting added to that figure, the cost to the public purse of maintaining the Palace before we decant will be more than £500 million. The figures may prove to be conservative estimates. As the answer from the Senior Deputy Speaker concedes ‘It is possible that reactive maintenance costs may rise in future as the condition of the Palace continues to deteriorate.’ Keeping the Palace in a fit state of repairs appears to be a case of running in order to stand still – there are myriad works going on – and the Palace could at any point between now and getting out suffer a catastrophic failure of one or more essential services. Both Houses should have voted on the issue at least a couple of years ago, but the debates kept being delayed. There will now be a debate next month. There is a need to treat the issue with a greater seriousness, and urgency, than we have seen to date, both for the welfare of those who work in the Palace and for the impact on the public purse. That impact will be even greater in terms of the decision as to whether to go for a full or partial decant of the Palace. Delaying the decision has not been cost free. 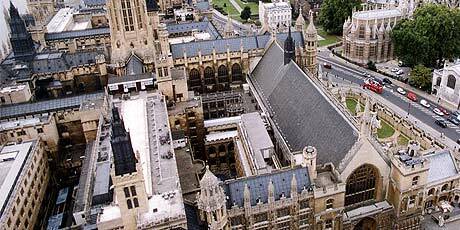 This entry was posted in Uncategorized and tagged Palace of Westminster, restoration and renewal programme. Bookmark the permalink. With respect to the VAT, would it be better to wait until the UK can review taxation issues post-Brexit? Or is it a matter of robbing Peter to pay Paul? VAT is irrelevant for central gov spending. The only decision to be made is move out wholly or partially. Voting on estimates is pointless as there is not a remote chance of their being right so why bother pretending you are making an informed decision. Hmm, the reply from the Senior Deputy Speaker confirmed VAT was included. It’s probably not as simple as shuffling paperwork: after all * straight face *, that’s what budgets are for. If Portcullis House didn’t exist the project would have been finished by now. Going back to the Sept 2016 report, some of the Lords are expected to continue working in the Palace throughout the restoration; I wonder what was meant by ‘some’. The slightly funny thing is that if treated as a listed building the HoP would have been VAT exempt until Cameron’s silly gesture politics during austerity! I tend to take the view that at least one house ought to remain during restoration to maintain the continuity. It would seem slightly absurd if the parliament managed to stay while half bombed out during the war but can’t for (albeit extensive) restoration works. I do not see why all the offices/facilities could be vacated but one chamber (or even Westminster Hall) could not be sealed off from the rest of the works. Portcullis House already provides a lot of facilities that parliament did n’t have at all not long ago.